Electronics « Global Market Insights, Inc. The digitization trend conquering the world has indeed created a lucrative roadmap for global Superconducting Materials Market. The growing demand from end-use industries for technologically advanced equipment to enhance the operational efficiency will significantly fuel the superconducting materials market share. The broad application scope of superconducting materials has initiated a plethora of research activities in the industry, driven by which the superconducting materials industry size from research and development sector is anticipated to register a CAGR of 17% over 2017-2024. 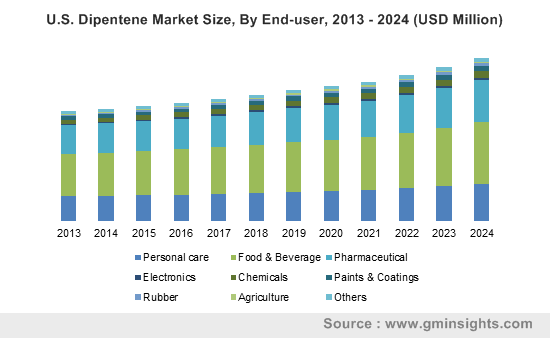 Swelling demand for these materials in the transportation, telecommunication, medical, and the electronics sectors has also been commendable over the years. For instance, in the telecommunication sector, these materials have gained profound significance and have replaced the conventional filters, owing to the former’s efficacy in picking up signals and improving the antenna range. 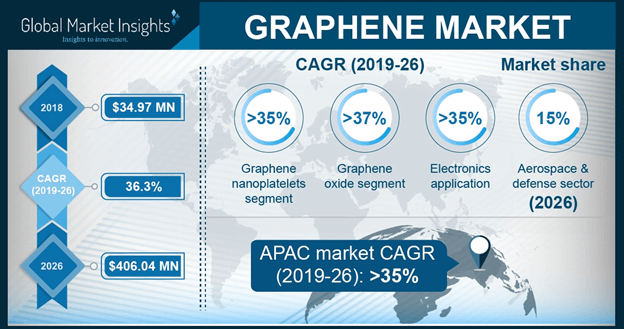 A subsequent rise in research and development projects in Asia Pacific has prominently fueled the regional superconducting materials market demand. The rapidly developing transportation, electronics, and telecommunication sectors in the region have positively swayed the regional R&D trends. The soaring medical industry is another promising driver impacting the growth of regional market. 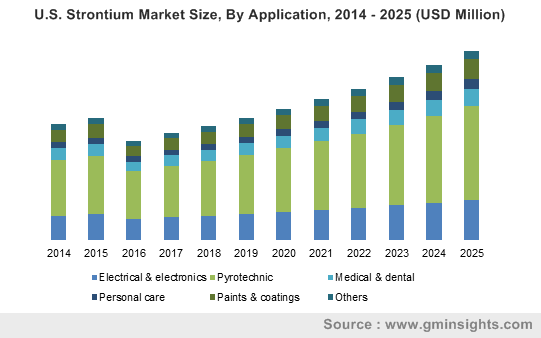 Increasing health awareness and development of the healthcare facilities in APAC have led the regional medical industry to substantially contribute to the expansion of the superconducting materials market size. In 2016, Asia Pacific led the global industry landscape by generating USD 250 million in terms of revenue. Medical industry is one of the leading application segments of the superconducting materials market, which generated revenue worth USD 640 million in 2016. Superconducting products are highly used in manufacturing of machineries which are used in MRI, Magnetoencephalography, and NMR (nuclear magnetic resonance) processes. Low temperature superconducting materials are prominently used for manufacturing of these machines which indeed depicts a significant demand in the medical industry. Furthermore, the increasing government investments for the development of medical and healthcare sectors have further contributed toward superconducting materials industry growth. As per the estimates, this application is projected to witness highest gains over the period of 2017-2024. The ever-growing electronic sector is another prominent driver, fueling the superconducting materials industry trends. For instance, superconductor materials based electric generators demonstrate an efficiency of more than 99%, which is way higher than the traditional copper-based electric generators. 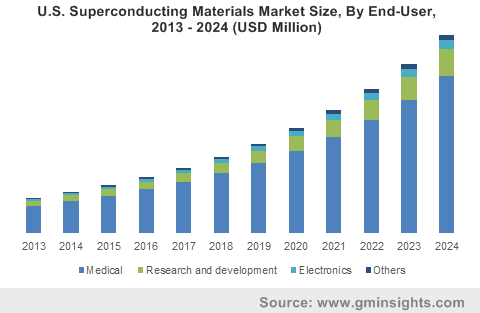 The strong growth of electronics sector coupled with the increasing consumer spending on the electronic gadgets are the notable drivers propelling superconducting materials industry share. Global superconducting materials market is estimated to witness a CAGR of 17% over the period of 2017-2024 with a target revenue of USD 2 billion by 2024, according to Global Market Insights, Inc.
Fast paced technological advancements coupled with the phenomenal developments in the electronics industry have provided a substantial impetus to North America superconducting materials market, slated to register a CAGR of 16% over 2017-2024. In addition, the well-established healthcare and medical infrastructure, from the technological perspective, has also prompted the use of advanced machinery and equipment in this region, thereby boosting the regional trends. The industry is characterized by long-term contracts between the business participants and the end-use industries to address the specific manufacturing demands. The ecosystem is also witnessing heavy investments in R&D and strategic collaborations as a part of the major growth tactics adopted by the market players. American Superconductor, Hyper Tech Research, Inc., Hitachi, Siemens AG, and Superconductor Technologies, Inc. are few of the notable players in the superconducting materials industry space. This entry was posted in Polymers and Advanced Materials and tagged Electronics, High Temperature superconducting materials, Low Temperature superconducting materials, Medical, Research & Development, Superconducting Materials, Superconducting Materials Market, Superconducting Materials Market Analysis, Superconducting Materials Market Forecast, Superconducting Materials Market Future, Superconducting Materials Market Growth, Superconducting Materials Market Outlook, Superconducting Materials Market PDF, Superconducting Materials Market Report, Superconducting Materials Market Share, Superconducting Materials Market Size, Superconducting Materials Market Trends, Superconducting Materials Market Update.